Representing four billion people, more than half the world's population, the 2014 Asian Games get underway Sept. 19 in Incheon, South Korea, athletics competition running from Sept. 27 to Oct. 3. With 2013 Moscow World Championships marathon 4th-placer Ryoko Kizaki (Team Daihatsu), veteran Eri Hayakawa (Team Toto) and 2:08 men Kohei Matsumura (Team Mitsubishi Juko Nagasaki) and Yuki Kawauchi (Saitama Pref. Gov't) Japan has serious medal prospects in both the Oct. 2 women's marathon and Oct. 3 men's marathon, and you have the chance to show your support and win some quality schwag by predicting how they do in JRN's Asian Games Marathon prediction contest. To enter, click here to send JRN an email with the subject line 'Asian Games prediction contest.' Look at the official start lists below featuring Japan's main competition and email your prediction for each Japanese runner's overall finishing place and time including seconds. List 'DNS' for any runner you think will not start. List 'DNF' for any athlete you think will start but not finish. You must fill out both the men's and women's listings to be eligible for the grand prize. Entries must be received by 9:00 a.m. on Thursday, Oct. 2 Japan time to be considered. 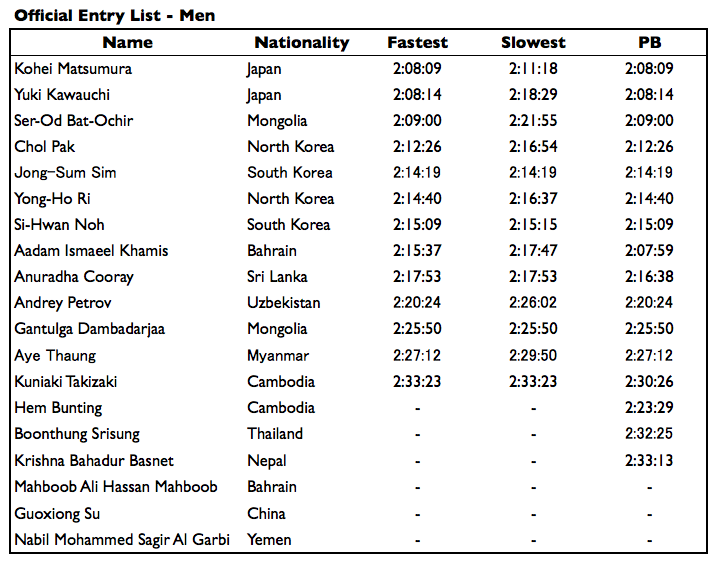 Late, incomplete or multiple entries will not be accepted, but updated entries to reflect men's start list changes will be accepted up to the start of the men's race at 9:00 a.m. on Friday, Oct. 3 Japan time. Winners of all prizes will be notified by email. The contest entry with the most accurate combined predictions for both the men's and women's marathons will win the grand prize, a beautiful custom-made 32 cm x 8 cm stainless steel finisher's medal hanging wall display by the U.K.'s The Runner's Wall bearing Yuki Kawauchi's motto "Genjo Daha," "Make a Breakthrough." See the video above for the back story on Kawauchi's motivational phrase. The closest predictions in the men's and women's races will receive copies of the second issue of Like the Wind, a new magazine featuring writing, photography and art by runners for runners. Issue three, including a story on Kawauchi by JRN's Brett Larner, is due out any day. The 2nd and 3rd-most accurate combined predictions win limited edition Yuki Kawauchi uchiwa hand fans produced by broadcaster TBS, which will offer 80 hours of prime time Asian Games coverage. Hello. I just recently came across your blog and I find it very informative. I am a member of a triathlon team in Tokyo, and our coach has been coaching Eri Hayakawa for the last 3 years or so. 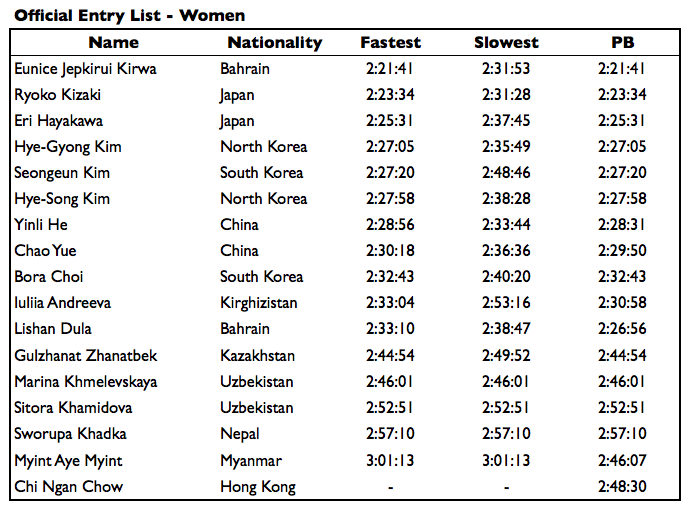 I am also a fan of Yuki Kawauchi, so I am quite interested in this marathon. I haven't had much luck finding information about the other teams or prospective medalists, so I am looking forward to any information you provide. Thank you for your interesting posts!